“Nella the Princess Knight” is a brand-new animated preschool school on Nickelodeon that chronicles the adventures of an eight-year-old girl named Nella who is both a princess and a night. When her kingdom encounters a problem, Nella is fast to help save the day and promote compassion, inclusiveness, and self-confidence. Debuting on February 6, 2017, the show already has forty half-hour episodes ready to be aired as well as an app and several online games and activities. Nina Hahn, SVP of International Production & Development for Nickelodeon, recently discussed the show and its potential. Meagan Meehan (MM) of Movie Vine: Nella is both a princess and a knight. How did the concept for this series come about? Nina Hahn (NH): We are always looking for smart, unique, and surprising content at Nickelodeon. We asked ourselves, “what’s Nickelodeon’s version of a princess?” and the answer was clearly a Princess Knight. As the one and only Princess Knight, Nella is unconventional and possesses the royal qualities of a princess, like compassion and grace, while also embodying the courage and determination of a knight. She transcends traditional roles and expectations through her ability to transform into the Princess Knight and protect her kingdom. MM: How long has Nella been in development and what is your role in the series? NH: I oversee international content development and co-production partnerships for Nickelodeon outside of the U.S. “Nella the Princess Knight” falls under my purview as part of Nickelodeon’s global development and production slate. I’m involved in managing the process from the pilot through to the series airing on television. Prior to production, we were developing Nella for about a year. It was important to us to get it right! MM: Do you have a favorite episode or character? NH: Easy answer–Nella is my favorite character. It’s nice to have an empowered female lead that embodies the notion that, as a girl, you don’t have to choose between dancing at extravagant balls or meeting fire-breathing dragons–you can like both. MM: What do you hope preschoolers will take away from the show? NH: Nella is a terrific role model for preschoolers. Through her example, I hope preschoolers will gain self-confidence, be more inclusive and have compassion for others. MM:What advice can you offer to people who want to have a career in animation? NH: You need to really love the genre of animation. Also, watch a lot of cartoons and have a strong point of view. Finally, it’s really important to know your audience. MM: What has been the most rewarding part of working on “Nella the Princess Knight”? NH: There’s a little bit of Nella in all of us, as we have increasingly diversified interests and take on more and more roles at work and at home, in an effort to ‘do it all’ all of the time. Being part of the creative process of developing such a strong, empowered character like Nella who reflects that has been a very rewarding achievement. To learn more about “Nella the Princess Knight,” visit the official Nick Jr. website. 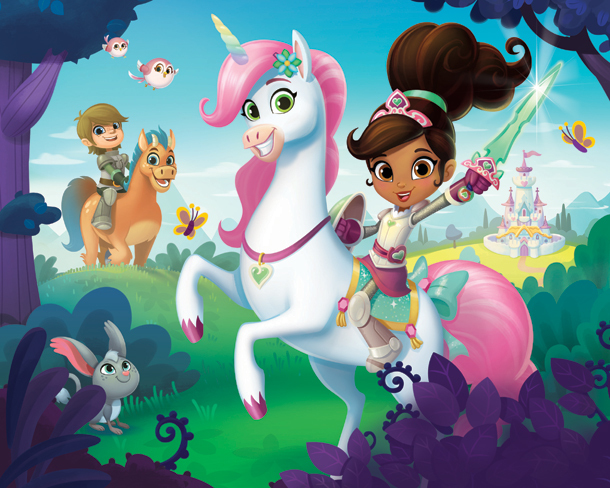 Comments for Nina Hahn, the SVP of International Production & Development for Nickelodeon, discusses ‘Nella the Princess Knight’ are now closed.